Poor piece of bread, concealed under a variety of stuff, but without it, this open sandwich is not complete. This is not my type of a meal but I got stuffed when it was served in front of me. I’ve been living here for more than 11 years, yet I haven’t learned to resort my hunger to just bread and stuff like ham or cheese. Just recently I tried shrimp sandwich and though it went fine in my taste I wouldn’t prefer it when I’d get hungry. But I was more than surprised myself when I ate up this stuffed open sandwich. 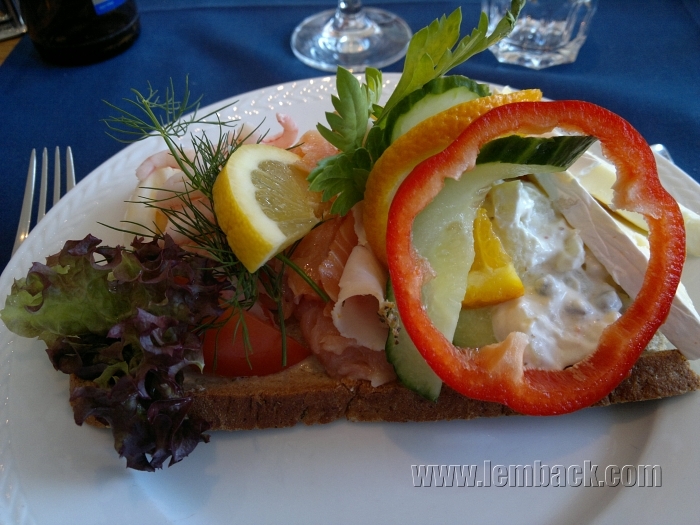 open sandwich with shrimp, ham, salmon, etc. The stuff on this bread: salmon, shrimp, turkey ham, potato salad, brie cheese, orange, lemon, tomato, bell pepper, tomato, cucumber, green salad, dill and that green leaves on top. Thanks a lot for your tips. Even though I don’t have a nightlife and hangover in the morning, I still like to have toast sometimes for breakfast. i’m sure it’s delectable – but i’m not quite sure about the healthy of this combination of fish with ham and cheese… maybe i’m wrong. tell me what do you think. I think it’s a healthy combination but the ham is not appealing to me. I wasn’t used to open sandwich either but here in Europe it’s quite popular. A great example of this is a open face sandwich made with pink bread topped with a decorative swarl of cream cheese thats topped with pink edible rose pedals. pimento cheese The term high tea in the United States Tea Sandwiches are served at and .See also Resource Links This article is licensed under the GNU Free .